This week I had the pleasure of attending the 25th anniversary celebration of Foxcroft, a clothing company known for its well-priced women’s tops. As a style reporter, I appreciated the opportunity to "touch base" with Foxcroft, whose designs seem tailor-made for the over 50 woman. The event also gave me an opportunity to meet other bloggers writing for women of a certain age. Are you familiar with Foxcroft tops—shirts and sweaters? I'm not surprised if your answer is “yes.” Foxcroft designs can be found in large department stores, such as Nordstrom and Bloomingdales, as well as in over 600 specialty stores. Women can also shop online at the company’s site or on Amazon.com. Foxcroft shirts and blouses are known for their classic American styling (see tops above) and non-iron convenience. According to Regina Wynn, Foxcroft marketing director, the brand has been featured on Oprah as well in Redbook and Maria Claire. Here's Regina, wearing a Foxcroft tunic. The Foxcroft anniversary celebration was held in the loft-like (huge windows and exposed brick) offices of Maker and Co. in the heart of New York's famed Garment District. The Garment District is a rather eclectic place. 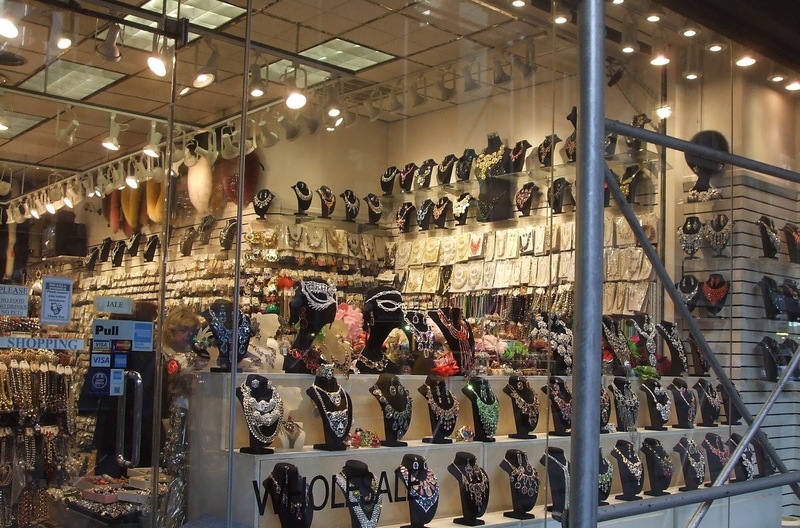 On the one hand, countless wholesale shops, specializing in anything garment-related, from spools of ribbon to highly-ornate costume jewelry (see below), line the streets. Meanwhile, brilliant designers, such as Vera Wang, are hard at work on luxurious apparel in the lofts spaces above. But I digress. The Foxcroft event, which was largely attended by women bloggers with sites geared to women over 40, was very relaxed and social. I had a chance to chat with many interesting women over 40 and 50. (I had no idea there were so many over 40 bloggers in the New York area!) It was so much fun to meet Judy Freeman of A Baby Boomer Woman's Life After 50 (below, left) and Cathy Chester of An Empowered Spirit (below, right). I also met a group of Connecticut bloggers over 40. They'd piled in a mini-van and drove down to the city from the Hartford area. It sounded like fun. Here's the very stylish Natasha Samuels of One Woman's Style Evolution. I love Natasha's hot pink slacks. And what about those shoes? Once all the guests had arrived, Thomas Dietrich, president of The Apparel Group (Foxcroft's parent company) and Ms. Wynn made a few remarks. According to Mr. Dietrich, Foxcroft is moving into dresses and bottoms. 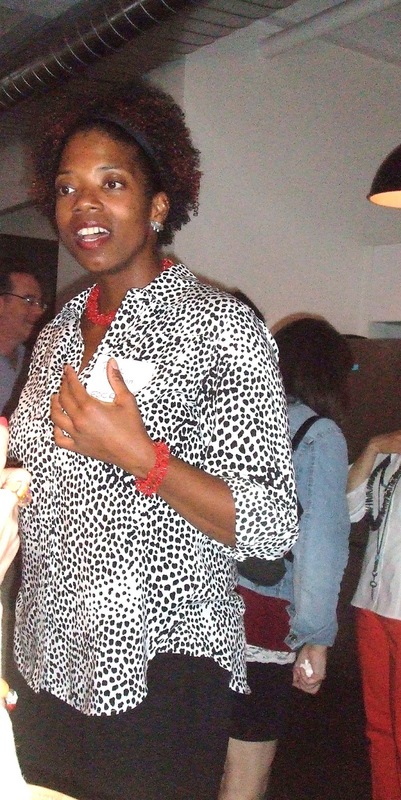 As part of the festivities, each blogger was fitted for a Foxcroft blouse. Spoiler alert: You can expect to see a post on styling my Foxcroft blouse in the near future.